John Palmer, Jun. was born in 1776, one of eight children of John Palmer (1744-1798), a celebrated stage actor. The younger Palmer’s life was difficult: his mother died young, and his father—who was known as a rather dissolute and untrustworthy character, nicknamed “Plausible Jack”—had difficulty supporting his large family. The older Palmer famously died on stage in 1798 while acting in Kotzebue’s The Stranger, speaking the line “There is another and a better world” before dropping down dead. Following in his father’s footsteps, John Palmer, Jun. made his acting debut on June 20, 1791, playing Prince Hal to his father’s Falstaff in Henry IV, Part One. Later, he supplemented his income by writing. 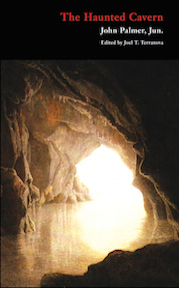 His first novel, The Haunted Cavern, appeared in December 1795, was widely reviewed, and apparently sold well, or at least well enough to be reprinted in Dublin, New York, and Baltimore the following year. 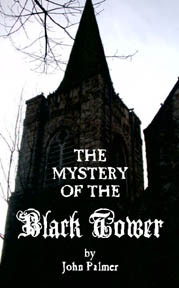 Palmer’s second effort, The Mystery of the Black Tower (1796), was printed by William Lane’s Minerva Press and was sold by subscription. Other novels followed: The World as it Goes; or, Portraits from Nature (1803) and The Mystic Sepulchre; or, Such Things Have Been (1806).